← Victory Seeds to the Rescue! 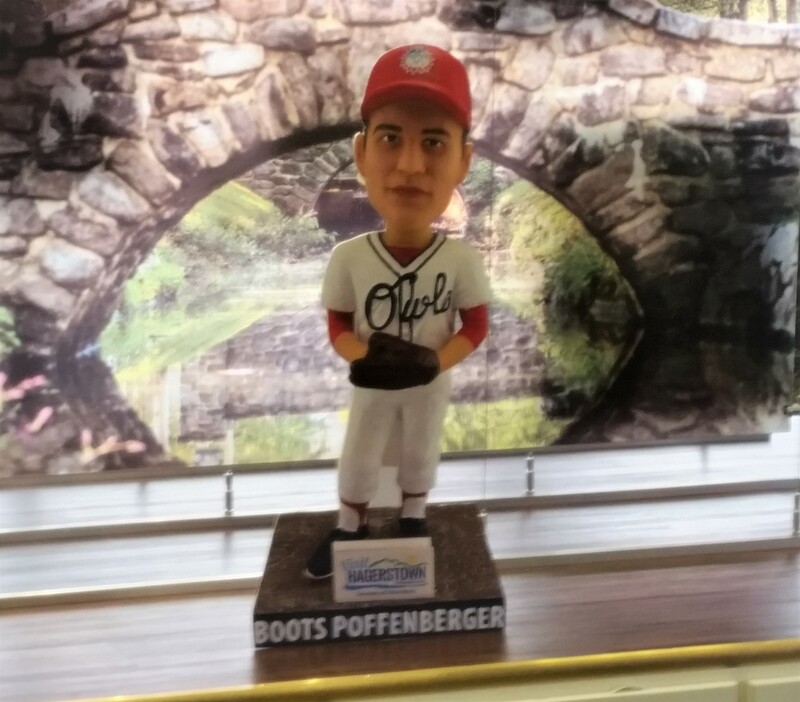 My old friend, Boots Poffenberger is back in the news, as the Washington County Convention and Visitor’s Bureau has announced that its “mystery bobble head,” to be given away at the August 12th Hagerstown Suns game against the West Virginia Power, is none other than Cletus Elwood himself. 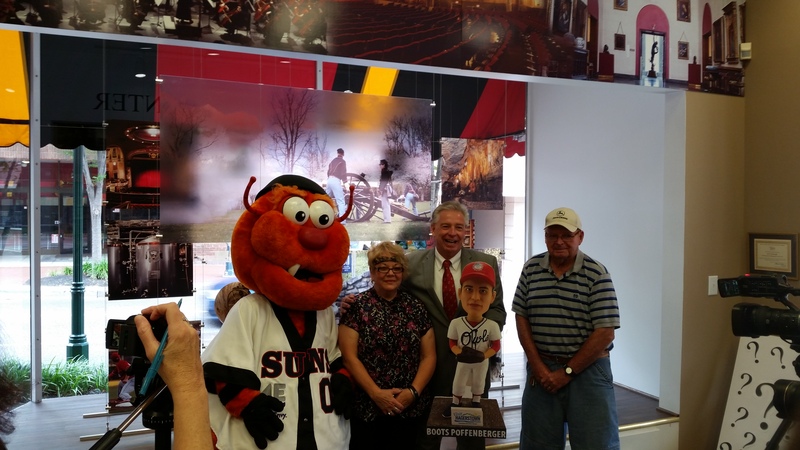 I was privileged to attend the grand reveal on Friday at the Welcome Center in Hagerstown. Also in attendance were Jerry and Joan Knode, Boots’ son and daughter-in-law. I expect that half of Williamsport will be in attendance on giveaway night and I predict that the Third Base Tavern will be emptier than it has been on any Saturday night since Prohibition. I can only imagine that Boots would be puzzled over this bobble head business, and it would be more appropriate to honor him by handing out beer mugs. In any case, I’ll be there on the 12th, answering questions and selling books and no doubt, more than anything else, listening to folks tell their Boots stories. That’s one of the privileges of being a writer: People carry around precious memories and and decide to share them with me. If you are interested in going, I suggest buying tickets in advance. The gates will open at 4:30 that night, which is a Saturday, and the game begins at 6:05. Get there early, for the bobble head will be given to the first 1,000 fans only. For you Nationals fans who might not know, the Hagerstown Suns are a Washington Class A affiliate. I’d love to see you there and believe me, you’ll receive a one-of-a-kind souvenir of a truly one-of-a-kind person. Click here for WDVM’s segment on the reveal. Click here for the Herald-Mail’s story on the reveal. This entry was posted in Boots' biography and tagged Boots Poffenberger, Dan Spedden, Hagerstown Suns, Jerry Knode, Joan Knode, Third Base Tavern, Washington County Convention and Visitors Bureau, Williamsport MD. Bookmark the permalink. Sorry that you won’t make it, Jerry.